Today was not my day, in terms of blogging... It started off well enough, as I was de-cluttering my desk and working out a bit of a schedule but it went downhill from there. I couldn't find my memory card, so I opened a new one. I wouldn't work in my camera (odd, right?) Searched and found the missing one. I started to take photos only for my camera battery to die. You'd think after a few years I'd have a backup now. When it came to swatching the lovelies in this post- China Glaze Sand Dolla Make You Holla and Orly Flawless Flush- things weren't any better as I nicked my nails not once, or twice, but three times. I got it right, eventually. Flawless Flush is a pale lavender with subtle golden shimmer from the Orly Blush Collection (Spring 2014). The shade is gorgeous, and although it seemed quite thin on the first coat, only needed two for full opacity. Sand Dolla Make You Holla (apart from having a terrible name) is a mix of multi-coloured glitter in a milky white base with a sugary textured finish. The formula was kind of terrible to work with as it was very thick and prone to clumping on the nail. The bottle definitely needs to be thinned before using it again. 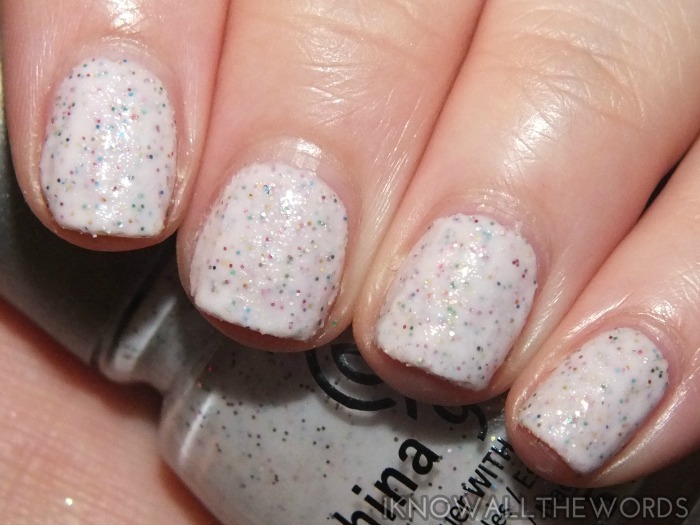 Anyhow, it only required two coats, and does look pretty amazing once on the nail- like sugary frosting with sprinkles! Have you tried either of these polishes? Thoughts?